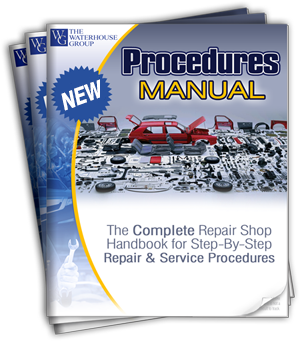 Get your personalized Procedures Manual Today! You can purchase either through our regular online secure payment system, or via PaPal. If you prefer American Express use PayPal. Click either of the buttons below to proceed. Your top 15 most repetitive jobs (ex Oil Changes, tire rotations, flushes,etc.) constitute approximately 70% of your activity. This manual lists the top 25 most repetitive jobs or about 90% of your activity. It comes personalized with your shop name on every page. Just $126.00 !